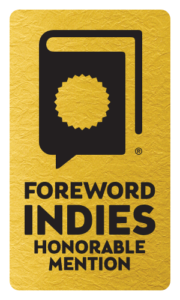 Beautiful Dreamer’s anthology, Not Just Another Pretty Face, won Honorable Mention at the Foreword INDIES Book of the Year Awards for 2016 in the category of Erotica. The book was also a finalist in the Rainbow Book Awards, the Independent Publisher Book Awards, and the Foreword INDIES Book of the Year Awards in the category of LGBT fiction. 2017 Inductees into the Saints and Sinners Hall of Fame. From left to right: Jericho Brown, Carsen Taite, Mark Drake, Louis Flint Ceci. 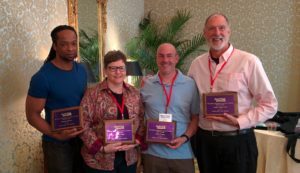 Beautiful Dreamer Press’s publisher and chief editor, Louis Flint Ceci, was honored at the 2017 Saints and Sinners Literary Festival, held in New Orleans this past March. Recognized for his contributions to the festival as well as his activities as editor, publisher, and author, Ceci was inducted into the festival’s Hall of Fame. His short story, “MUST LOVE ANIMALS,” was also a finalist for the festival’s annual short story contest. and is published in Saints+Sinners 2017: New Fiction from the Festival. Many of you know that I take my middle name, Flint, from my partner, Don Flint, who passed away from a brain tumor in 2000. What you many not know is that the name of my press, Beautiful Dreamer, also comes from my time with him. The presentation and acceptance speeches were caught on video, thanks to David Pratt, whose novel, Wallaçonia, was published by Beautiful Dreamer Press this spring, and Michele Karlsberg, Beautiful Dreamer’s publicist. The complete video can be seen here.